I found this interesting lady (NatashasKitchen.com) online looking for something else. I have never even tasted Borscht so I thought I would try. 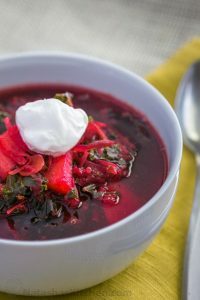 There are 5 superfoods in this borsch: quinoa, beets, kale, onion (did you know onion was a superfood? ), and beet greens (the greens from the stock of the beets). If you can’t find the beets with stems on; no worries, just use a little more kale. I tweaked it a bit but not much. I know. I know. Red/Purple food right ? But I am being very serious right now … this stuff is good! Over medium/high heat fill a large soup pot with water, Add Bouillon paste and halved onion. Bring to a simmer, then add the chopped potatoes, quinoa and carrots. Let cook 5 minutes. Add grated beets, toss in bay leaves, chopped kale and the beet greens if you are using them. Stir and bring to a light boil and continue to cook uncovered 20 minutes. Your veggies should be soft when done. Discard the cooked onion halves, if desired. Add lemon juice, Tajin and ketchup. Stir and bring back to a boil. Season with salt and freshly cracked black pepper to taste before serving. Serve with a good hard crusted bread and a dooip of sour cream or mayo.